Besides measuring with state-of-the-art plant sensors and equipment, the Laboratory of Plant Ecology aims at creating added value by process-based plant modelling. We also use the powerful combination of sensor measurements and plant models to develop plant-based control and stress detection systems. Our process-based or mechanistic plant models are typically first implemented in the plant modelling software PhytoSim developed by our Spin-off company Phyto-IT. To build reliable dynamic plant models and ensure good modelling practices, we also use techniques like uncertainty analysis, sensitivity (local and global) and identifiability analysis. The developed plant models can then easily be converted into optimized code, which can run on the PhytoSense platform to be used in specific applications or plant-based control and stress detection systems, which benefit from online model simulations and (moving window) model calibrations. A plant-based control and stress detection system that resulted from our approach of combining continuous plant sensor measurements with a plant model is STACI, the Software Tool that was developed for Automatic Control of Irrigation. The STACI model is a simplified version of the mechanistic water flow and storage model RCGro, developed by Steppe et al. (2006). 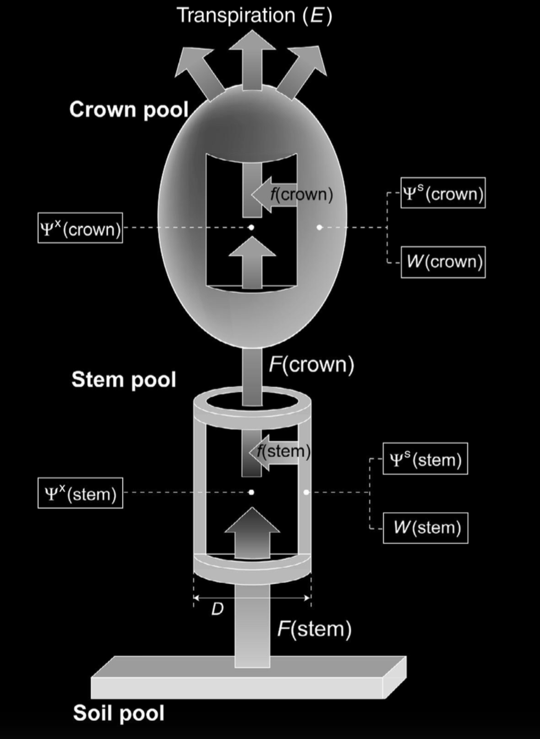 The RCGro model was simplified to only describe the processes in the stem compartment and uses measured sap flow as the only model input. The STACI research tool was developed to optimally combine continuous plant measurements, mathematical modelling and real-time irrigation scheduling. Started from a simple Ohm’s law analogue model proposed by van den Honert (1948) for steady-state water transport, the mechanistic water flow and storage model RCGro has been developed by Steppe et al. (2006). To describe tree hydraulic functioning as the soil dries out, the water flow and storage model STACI is further developed by implementing equations that describe variation in xylem hydraulic resistance (RX) and stem hydraulic capacitance (CS) with predawn water potential (ΨPD). This refined model version was satisfactorily implemented in field-grown Q. ilex trees experiencing intense summer drought characteristic of the Mediterranean region. The hydraulic resistance is described to vary exponentially with ΨPD (Baert et al. 2015), which accounted for day to day reductions in hydraulic conductance with soil drying: RX = r1e(ΨPD2)r2, where r1 and r2 are the proportionality parameters influenced by plant characteristics. 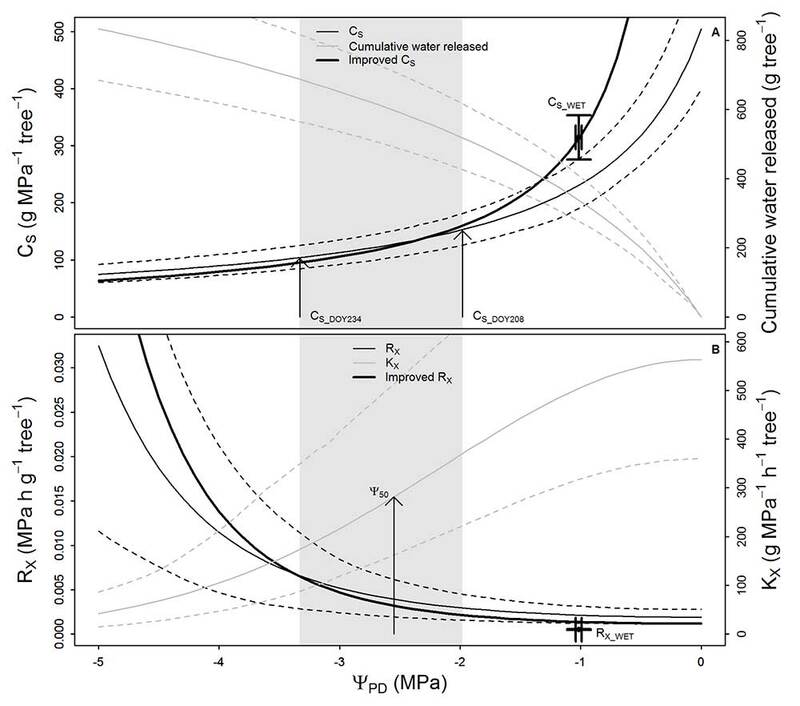 The hydraulic capacitance of the stem is defined with an inverse equation between CS and ΨPD to account for the progressive depletion of tree water reservoirs along the dry season (Salomón et al. 2017): CS = 1 / (c1ΨPD+c2), where c1 and c2 are the proportionality parameters dependent on plant properties. Stem sap flow and predawn water potential (or alternatively soil water storage) are used as model inputs, whereas stem diameter variations and xylem water potential are used for calibration. Radial stem growth is turgor-driven and based on Lockhart’s equation for irreversible cell expansion.